He was born in the Pentapolis or Qairawan (Now Tunisia or Libya according to other sources) approximately 15 years after our Lord was born. He witnessed the preaching of our Lord in Palestine as well as his passion. He is the author of the earliest Gospel to be written (it was written in Greek). He was the founder of Christianity in Egypt or in Alexandria at least. He came to Alexandria approximately 48 AD. According to some sources, St. Peter preached in Babylon about the same time St. Mark was in Alexandria, however he focussed on the Jews of Babylon (A city near Memphis, Cairo now). 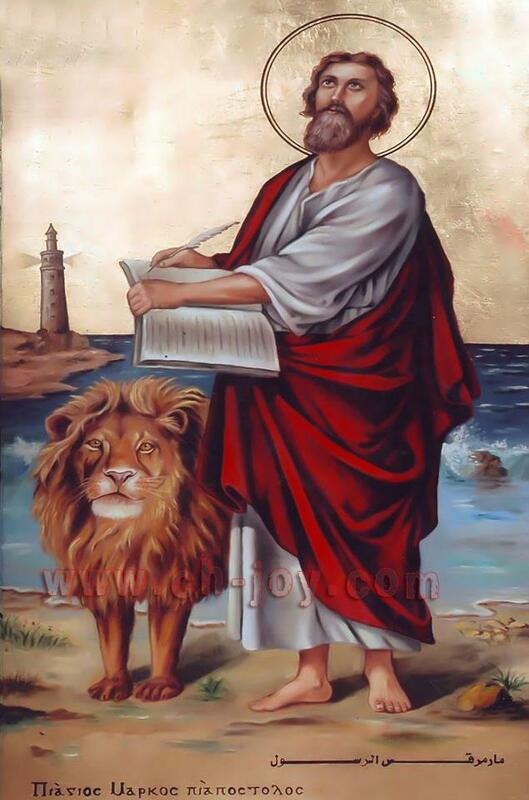 St.Mark was arrested during a festival of Serapis (the Serapion-Abbis Greek Egyptian god) in AD 68 and martyred by being tied to a hose's tail, and dragged through the streets of Alexandria's district of Bokalia for two days until his body was torn to pieces. He was buried under the church he had founded.The Church celebrates his martyrdom on the 8th of May each year.His head is in a church named after him in Alexandria, and parts of his relics are in St. Mark's Cairo's Cathedral. The rest of his relics are in the San Marco Cathedral in Venice, Italy. Of his titles are: The Apostle, the Evangelist, the Witness and the Martyr.